Hood River | Odell || Next Chapter . . . Pioneer Menu . . . Search - - Oldest presented first. To give historical perspective: The first permanent settlers in what was to become Hood River County filed a donation land claim in 1854; by 1880 seventeen families lived in the region. Our first story begins in 1882. Troy and Annie Lewis Shelley were overland pioneers. He came with his parents, Michael and Sena Shelley, from Iowa in 1848. They were married while attending the "annual meeting" at Rickreall by Levi Lindsay Rowland and Glen Owen Burnett in 1871. He had started preaching two years before that. Troy's father and mother were charter members of the Pleasant Hill Church in Lane County. In June of 1882 Troy and Annie packed their belongings in a big wagon and moved to Odell, where they spend the rest of their years. One early record says, "The family camped while the father built the house and lost his rheumatism." Troy also taught school at nearby Pine Grove and was later elected Superintendent of School for Wasco County. (A portion of this area later became Hood River County.) They had eight children. Troy had a fine tenor voice and he taught people to sing, as well as the children at school. All of the greater Odell family were converted and many of their neighbors. William Odell became Justice of the Peace, County Commissioner and then in 1871, Surveyor General of Oregon. In our photo of the two-room building built about 1880, it appears there was a start on a school band. (This photo dates from about 1902.) 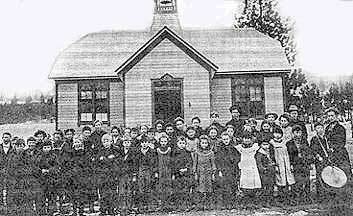 At about this time - 1902 - a new school house was built and the school trustees objected to having church in the school. Then was begun the Union Church . . . . Our first seats were rough boards. April of 1902 saw the first service. It had taken a long time . . . . Mr. Shelley whose passion was union of all Christians, always preached the first Sunday in each month, and the Lord's Supper was held. At one communion, members of 11 sects took the Supper together. Seemingly in the new facility, Troy Shelley's passion for union overcame his desire to restore the basic church of the New Testament and a truly union church resulted. The group diminished and finally ceased to meet. Preachers Peak on the Hood River-Multnomah county line was named for Troy Shelley after he rode his horse to the summit. It was named by his son, R.S. Shelley, of the U.S. Forest Service. The Shelleys are buried in the Shelley Cemetery on Scott Road, in the woods near Odell. Later, services were re-started and the group was distinctly an a capella Church of Christ. 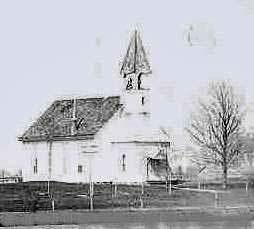 The Odell church still exists across from the school, but we have not been able to make contact with any members. This pioneer era congegation came into being in 1894 when the Disciples purchased an existing Congregational church building. John W. Jenkins was the minister until 1903. Jenkins was an 1880 graduate of Bethany College in West Virginia. In later years, the church fell on hard times and closed their doors for 15 years ending in 1943. The congregation merged with another (and later) Christian Church in Hood River in 1963. The unified name remains Hood River Valley Christian Church. There is a profile of John W. Jenkins. The congregation reached out in its own vicinity and helped establish the Christian Church right in Hood River. For some years prior to 1905 Ashley Cash, a member at Hood River Valley Christian Church, rode into town and conducted Sunday School at the Carmichael Hall. This led to a tent meeting and a new congregation was established in 1905. According to a 1909 map, the Christian Church was located at the northwest corner of the intersection of 9th Street and Eugene Street. There was a parsonage located closest to the corner.